Office politics can be a tricky affair. It’s easy to say the wrong thing when you’re under stress or you feel you’ve been treated unfairly. Maybe you’ve caused offense by criticizing someone in an unconstructive manner. Or perhaps it’s you who’s been criticized — and you’ve responded by trying to shift the blame. It’s easy to put your foot in your mouth when you’re working alongside a variety of hard-working people in a stressful environment. If this sounds like you, don’t worry. It’s possible to speak honestly at work without offending others, but it does take a little shift in perspective. When a problem arises, don’t think about how you can avoid it — instead, see how you can be a part of solving it. Acquiring these diplomacy skills won’t happen overnight, which is why it’s great to have a few hints on where to start. 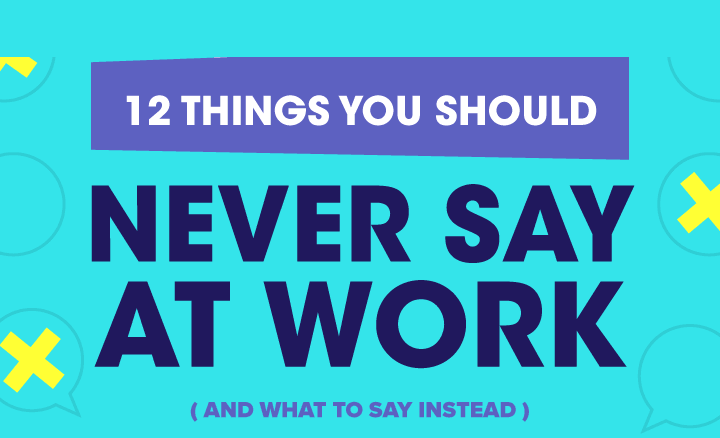 Headway Capital new infographic lists twelve phrases you probably hear at work every day, why they’re unhelpful and what to say instead. So next time trouble arises at work, think before you speak — it could be the beginning of a beautiful opportunity!